Western blot analysis of extracts from A431 cells, untreated or EGF-treated (100 ng/ml for 5 minutes), using Phospho-Afadin (Ser1718) Antibody. 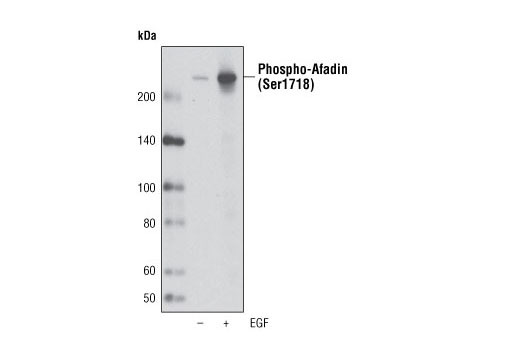 Phospho-Afadin (Ser1718) Antibody detects endogenous levels of l-afadin protein only when phosphorylated at serine 1718. Polyclonal antibodies are produced by immunizing animals with a synthetic phosphopeptide corresponding to residues surrounding Ser1718 of human afadin. Antibodies are purified using protein A and peptide affinity chromatography. In multicellular organisms, intercellular junctions play essential roles in tissue integrity and maintenance of cell polarity. Tight junctions (TJs) form a continuous barrier to fluids across the epithelium and endothelium (reviewed in 1). Adherens junctions (AJs) are dynamic structures that form cell-cell contacts linking cells into a continuous sheet (reviewed in 2). The actin filament-binding protein, Afadin, binds to nectin forming a connection to the actin cytoskeleton (3). AJs are formed when nectin assembles cadherin at the cell-cell adhesion site and these junctions are then involved in the formation and maintenance of TJs (4,5). Afadin has two splice variants: l-afadin, which is ubiquitously expressed, and s-afadin, which is expressed predominantly in neural tissue. s-Afadin is a shorter form lacking one of the three proline-rich regions found in l-afadin, as well as the carboxyl-terminal F-actin binding region (6). Human s-afadin is identical to AF-6, the ALL-1 fusion partner involved in acute myeloid leukemias (7). Recent work has also shown that afadin is involved in controlling the directionality of cell movement when it is localized at the leading edge of moving cells (8,9). Phospho-Afadin (Ser1718) Antibody is directed at a site that was identified at Cell Signaling Technology (CST) using PhosphoScan®, CST's LC-MS/MS platform for modification site discovery. Phosphorylation at Ser1718 was discovered using an Akt substrate antibody. Please visit PhosphoSitePlus®, CST's modification site knowledgebase, at www.phosphosite.org for more information. Shin, K. et al. (2006) Annu Rev Cell Dev Biol 22, 207-35. Harris, T.J. and Tepass, U. (2010) Nat Rev Mol Cell Biol 11, 502-14. Ikeda, W. et al. (1999) J Cell Biol 146, 1117-32. Sato, T. et al. (2006) J Biol Chem 281, 5288-99. Ooshio, T. et al. (2007) J Cell Sci 120, 2352-65. Mandai, K. et al. (1997) J Cell Biol 139, 517-28. Prasad, R. et al. (1993) Cancer Res 53, 5624-8. Miyata, M. et al. (2009) J Cell Sci 122, 4319-29. Miyata, M. et al. (2009) J Biol Chem 284, 24595-609.